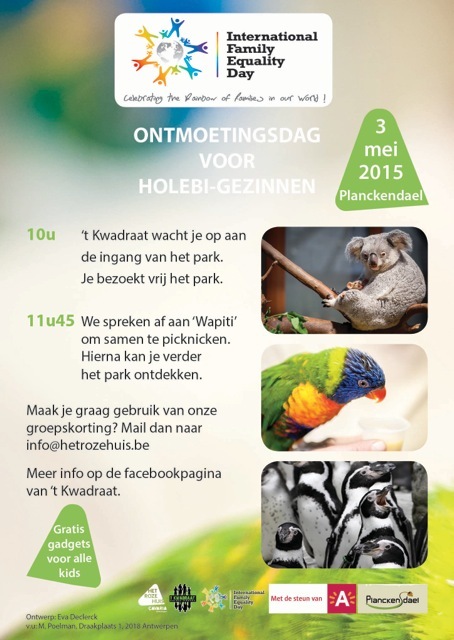 This year Antwerp’s very own Pink House (Het Roze Huis – çavaria Antwerpen) and LGBT family organization (‘t Kwadraat) invited LGBT families for a fun, relaxing day at the zoo Panckendael. The parents enjoy a discount on their entry fee and the children can have fun seeing all the animals. The goal is for families to get to know each other, but most of all for everyone to have a good time. Around midday everyone will meet up for a group photograph. Rainbow flags will be handed out to both parents and children. The children receive a fun gadget and a healthy snack. Next a lovely picnic will take place where the children can play with each other and the parents can talk amongst themselves. After lunch everyone can walk around the zoo again. Very special thanks to the City of Antwerp for their support.